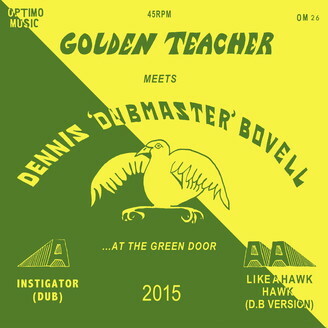 Here at Optimo Music we have been fans of Dennis Bovell for longer than we care to remember. We rate him as one of thee very best producers the UK has ever produced. From first hearing his work on the magnificent ‘Silly Games” by Janet Kay through his incredible solo albums, his production on albums by The Slits, The Pop Group, Linton Kwesi johnson, Orange Juice, Saâda Bonaire and many more to his astonishing mixes on piles of highly sought after dub 7″s. He has been active in music for 40 years and is still going strong. In 2014 he worked with artists ranging from Rihanna to Golden Teacher! When we heard he was going to be performing in Glasgow late last year we tracked him down and asked if he would be up for going into Green Door studios for a day and doing something with Golden Teacher’s music. He was and these are the results. Mr. Bovell did lots of overdubs, adding organ and other instrumentation, pitching down vocals and basslines and created these delirious dubbed out gems. On the A side is the previously unreleased “Instigator” while on the AA side he reworked Golden Teacher’s second single “Like A Hawk”. Housed in another classic sleeve designed by Oli from Golden Teacher this two track 12″ is a dream come true for us to release. Released on 12″ single and digital, April 20th. 2015. Distributed by Kompakt.